SET UP: Half - pitch, 10+ players needed. Coach plays out to a full back (A) who plays ball into area and supports (B) (C), together using (A) as support and (D) as a target man they must break out the far end of the box a deliver a cross into the 18 yrd box. As shown in the diagram (right) the target man is encouraged to play with his back to goal and set up the play before making his break into the box ready for when the ball is delivered. Player (A) full back is asked to hold after his ball into (B) (C) or (D) adding support & depth to the build up. Making sure he is always available to which ever player is in possession. Player (B) wide man is asked to give width, walk the line to either (i) receive and face up defender (ii) pull defender out of position. Any balls played beyond player (B) is the trigger for him to start a run in behind. Player (C) supporting midfielder is ask to create good angles and to support any balls played into (B) or (D) if player (B) has walked the line to receive the ball (C) may make a run into the space left. Player (D) frontman keeps out of the box adding depth to the drill, ask to play with back to the game and set balls for players (B) & (C). When ever (B) or (C) break out of the box (D) must pull away and attack the delivery of the ball. To enable a good success rate at the beginning defenders only work within the red square. 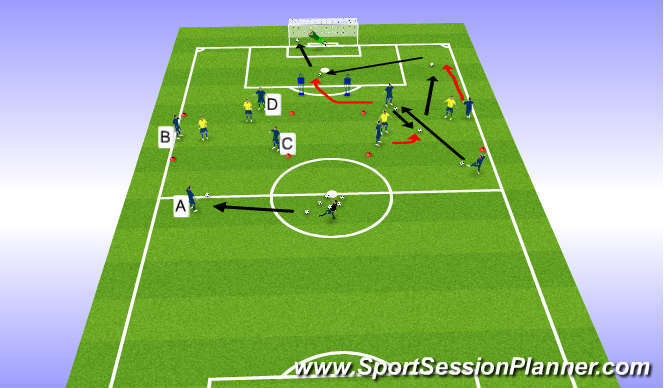 A progression would be to enable a defender to (i) attempt to bloke the cross (ii) defend the box against the attacker. If a defender wins possession or the play breaks down, Coach with a new ball will play to the opposite full back.